This series of drawings depict the religious snake handling practices of certain Holiness churches in Southern Appalachia. "Shorty Takes Up Serpents", "Arthur Reaches Into The Deep Light", "The Anointing of Miss Hopi", "The Miracle of the Triplets", "Meeting at the Brush Arbor", "The Ecstasy of St. Columbia Gay of Jolo" and " St. George Went Hensley of Grasshopper Valley Receives the Signs" can be viewed below by clicking on the picture. Clicking the buttons above will give you a larger image along with an explanation of each drawing. An initial impression upon viewing the drawings is the realist documentation of the folk history of Southern Appalachia. Upon reflection however, the viewer discovers the interwoven influence and roles that serpents and snakes have played throughout the course of both Christianity and art history. 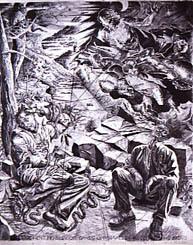 "Meeting At the Brush Arbor"
This interaction is strikingly demonstrated by the use of classical and Renaissance poses for the contemporary realist figures in the drawings. Numerous allusions are made to famous Renaissance and classical works which depict scenes in the history of Christianity and mythology in which serpents played a predominant role. 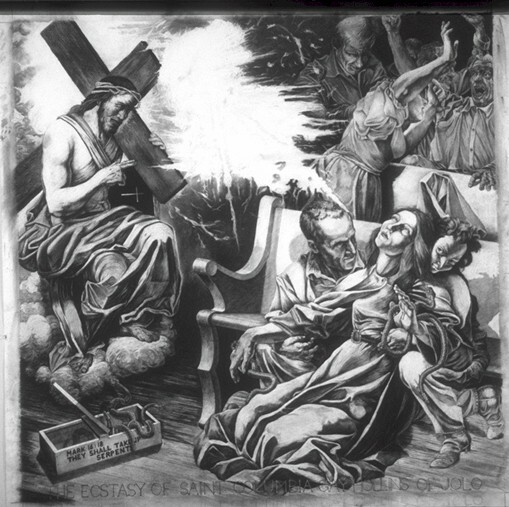 "The Anointing of Miss Hopi"
"The Miracle of the Triplets"
"Arthur Reaches Into the Deep Light"
Images and poses of the snake handlers were appropriated from works by Michelangelo, Rubens, Titian, Bronzino, Caravaggio, as well as the sculptors of the Laocoon group. Adding to the eclectic nature of the drawings are the subtle influences of Jackson Pollock, Kasimir Malevich, and Hopi Indian culture. "The Ecstasy of St. Columbia Gay of Jolo"
Grasshopper Valley Receives the Signs"
These drawings by Gary Monroe are done in charcoal on Somerset rag paper. Each drawing measures 60" by 48". For more information, or to leave feedback, please email us.